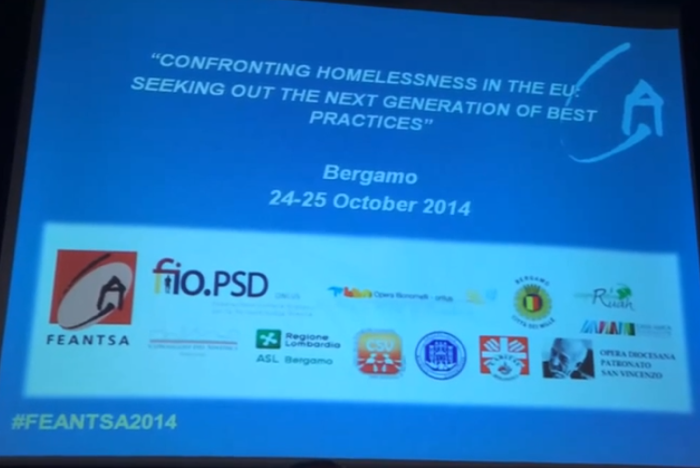 The 2014 FEANTSA Eu conference in Bergamo saw an enthusiastic participation, with more than 450 experts gathering from all around Europe & South America. The plenary sessions & the 12 thematic workshops has been a precious experience of mutual learning & exchange. Now all the materials presented during the workshops are available online in free download, together with the FEANTSA “Bergamo 2014 declaration”, which is also available here in various languages (English, French, German, Italian, Polish, Spanish). A video witnesses the conference activities, representing a small but precious gift to thank all participants in Bergamo & to welcome everyone to the 2015 Eu conference in Paris. Save the dates for 2015, & see you all in Paris.